Jason adopted Stark, then 5, in 2014. He had been at the shelter for a year and diagnosed with epilepsy. Jason joined the Navy because military service was in his DNA. 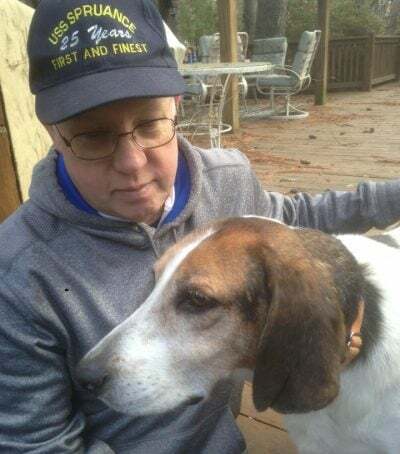 “I joined the Navy because my father and brother both had served in the Army, and I thought the Navy would be doing something different and exciting,” he told Pets For Patriots‘ Wet Nose Blog of his service. He spent the long course of his career repairing communications equipment, with tours on the USS Spruance and USS Hue City. His deployments took him to places including Spain, Florida, Virginia and Washington, D.C.
Now, after more than 20 years of service, he has retired. 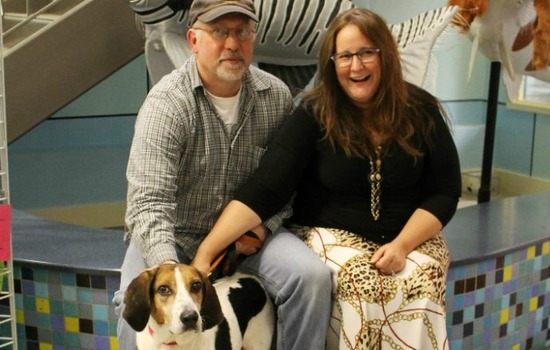 Years earlier, Jason and his wife, Kimberly had adopted a dog — Buddy. But after his retirement they decided Buddy needed a buddy of his own! So in 2014, they went to the Richmond SPCA, a Pets for Patriots adoption and veterinary partner. There they met a few dogs, including a 5-year-old hound mix. Jason knew that adopting this special needs dog was a big decision. 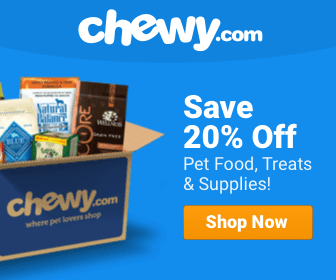 The couple learned as much as they could about epilepsy in dogs – and about Pets for Patriots and its companion pet adoption program for military veterans. Their research led them to two conclusions. Now with his cancer treatment in the rear view, Stark’s family hopes his future will be sunny. Stark suffered from internal bleeding and subsequently had his spleen removed. Jason and Kimberly fostered Stark through his recovery. Once the veterinarian gave the special-needs dog a clean bill of health, Jason was able to officially adopt this once-forgotten hound. Although retired from the Navy, Jason is still fixing things. Right now, he’s repairing copiers in the Richmond area. He and Kimberly have grown their pack to a four-legged family that includes Buddy, Stark and sister Molly. Life went on happily until December, 2016, when the veteran again reached out to Pets for Patriots. Stark had been diagnosed with soft cell sarcoma, a treatable form of cancer. If he received immediate and intensive radiation treatment he had an 85 percent chance to live a long, healthy life. 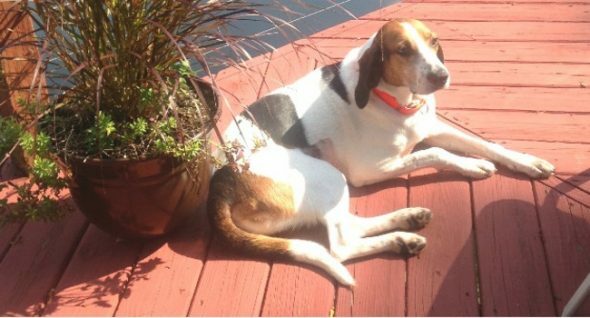 Pets for Patriots contacted Stark’s oncologist and negotiated a significant charity discounts, then raised enough money to fully fund Stark’s radiation treatments and spare Jason’s family from serious financial hardship. Stark’s radiation therapy appears to be a great success; he’s scheduled for a six-month follow up visit with the oncologist. The Navy vet and his wife are happy for the renewed chance to focus on caring for their special needs dog.